Plastic bags came into being in the 1960s and were introduced in the American supermarkets in the 70s with the rest of the world taking cue there on. The bags are convenient to use; they are light, cheap to manufacture and resistant to degradation. 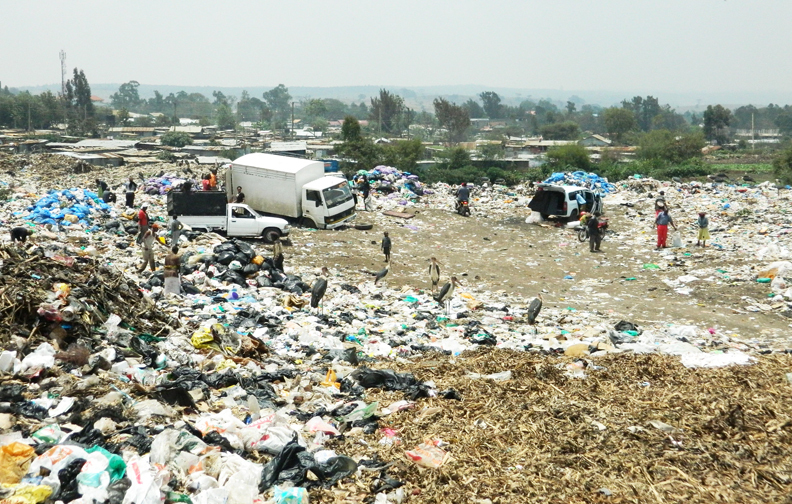 Nevertheless, these same properties have contributed to the proliferation of the bags in the environment posing a big challenge to solid waste management. But are we better off without these carriers? A 2005 research by NEMA revealed that there were then 176 plastic manufacturing companies in Kenya worth Ksh. 88 billion and providing 60,000 jobs. The plastic products—most of which are plastic bags—churned out for our use by this industry end up permanently in the environment; they do not decompose. One major resultant effect of the bags’ nature is clogging of drainage systems: This causes flooding and formation of puddles that provide bleeding grounds for mosquitoes and consequently malaria—that according to the Ministry of Public Health and Sanitation kills 30,000 people annually. When ingested by animals, plastic bags cause their eventual death; burning the bags releases toxic fumes that have been associated with various types of cancer while if thrown away—which is a common practice—the bags litter our landscape. We need to check the manufacture and usage of plastic bags. To echo the late Professor Wangari Maathai, “The plastic bags we have in Kenya are so flimsy that millions of them only get used once before being thrown away, you see them in the trees, in the hedges and on the ground…” Kenya banned the manufacture, import and use of polythene carrier bags on 28th February 2017 in order to protect the environment. The ban is a follow-up of extensive consultations with the stakeholders in the plastic sector. Earlier in 2007, a ban was imposed to check plastics below 30 microns. The onus to reduce—if not eradicate—use of plastic bags in our country is on all of us. The world is going green and the route there starts at eliminating the substances that pollute our environment-plastic bags being among the most obnoxious. At the individual level, we need to reduce the dependence on these bags to “carry stuff” home. We should reuse the ones we already have when we go shopping and seek environment-friendly carriers such as cotton cloth bags, paper bags, canvas bags, sisal bags, papyrus bags and buyers/shoppers own shopping bags. The penalty for breach of this ban is stipulated under Section 144 of the Environmental Management and Cordination Act Cap 387, which is imprisonment for a term of not less than one (1) year but not more than four (4) years or a fine of not less than 2 Million but not more than 4 Million or to both such fine and imprisonment. I couldn’t agree with you more Dr.Ayub, plastic bags menace is a big threat to environmental integrity of our country. The ban is quite in order. Ron, Yes, we will continue to product MoneyLife but it will only be available via podcast and online audio. Please let us know if you have any further quo!nietssHave a blessed day!